Top criminal justice officials from the Republic of Bulgaria were in Washington, DC, last week for training and information exchange sessions with their counterparts in the United States. Despite their busy schedule, the Bulgarian officials insisted on including one last stop on their itinerary: a visit to the National Law Enforcement Officers Memorial. Tsvetan Tsvetanov, Deputy Prime Minister and Minister of the Interior, led a delegation of seven Bulgarian officials who visited the Memorial late Friday afternoon to pay their respects to those who have made the ultimate sacrifice. They were greeted by NLEOMF Chairman and CEO Craig W. Floyd and a number of NLEOMF staff members. While law enforcement officer fatalities are much lower in Bulgaria than in the United States, Minister Tsvetanov said it is important for everyone to remember and honor all officers who have died in the line of duty, regardless of where they served. To show their respect for the 18,661 officers whose names are engraved on the U.S. Memorial, the delegation placed a wreath at the central medallion. The Bulgarian visitors exchanged gifts with Mr. Floyd, and Minister Tsvetanov did a rubbing of the name of Superintendent Fred Morrone of the Port Authority of New York and New Jersey Police Department, one of 72 officers killed during the terrorist attacks of September 11, 2001. As they prepared to leave the Memorial, the Bulgarian officials made one last stop: in front of the one of the lion statues for a group photo. The Police Executive Research Forum (PERF) is out with a new study on police use of body armor, and its findings are important reading for law enforcement officers, trainers and executives. PERF, a Washington, D.C.-based police research and consulting organization, reports that nearly all law enforcement agencies say they provide body armor to their officers, but only 59 percent of the agencies actually require their officers to wear body armor at least some of the time. The report details the findings of a survey that PERF conducted in partnership with the Justice Department’s Bureau of Justice Assistance (BJA). The survey was sent to a large nationally representative sample of law enforcement agencies. Of all those who received the survey, 80 percent responded, for a total of 782 participating agencies. Perhaps the research team’s most encouraging finding is that almost all agencies responding to the survey—99 percent—ensure that body armor is made available to their officers. Previous research indicated that in 1987, only 28 percent of police agencies surveyed provided body armor or a cash allowance to purchase armor for all of their uniformed patrol officers. By 1993, that figure had climbed to about 82 percent, and it rose to more than 90 percent in 2000. While the new survey indicates that body armor is now available to almost all officers, the PERF report suggests that police agencies can make further improvements in their policies and practices to help ensure that officers actually use body armor as much as possible, and to provide more thorough controls on fitting of armor to individual officers, maintenance of the armor, and periodic inspections to ensure that officers' armor is in good condition. For the full report visit http://www.ojp.usdoj.gov/BJA/pdf/PERF_BodyArmor.pdf. PERF is a membership organization of police executives from the largest city, county and state law enforcement agencies, and is one of 16 organizations represented on the Board of Directors of the National Law Enforcement Officers Memorial Fund. NLEOMF data on officers killed in the line of duty were used in the PERF study. Process Problem Solving Contributor for Officer.com. Article originally published on Tuesday, September 15, 2009. According to the National Law Enforcement Officers Memorial Fund in Washington D.C., the numbers this year are staggering. The mid-year report shows that as of June 30, 2009, 26 cops have died in automobile crashes. That compares with 19 cops at the same point last year. This is 37% more deaths. WERE THEIR LIVES STOLEN FROM THEM? That is the question of eternal discussion. There has been much speculation about the fact that vehicle related incidents have been the leading cause of officer deaths for the last twelve years. Other causes of death have declined while these continue to rise. We spend countless hours training in fighting and surviving assaults. We learn how to grapple, face a blade, use the Taser and fight with our deadly force weaponry. But the numbers are clear: cops are far less likely to die in an assault than they are a car wreck. Where is the training to prevent that? How many agencies routinely provide EVOC training to their existing crew? The answer (unfortunately) is very few. It is expensive. It chews up otherwise good vehicles. It often requires overtime, which few of today's law enforcement budgets can afford. Yet, this is the where and how cops - our brothers and sisters - are dying on the street. If we fail to act, then to some extent, we have become complicit. We standby while watching our young people - our most precious treasure - get routinely slaughtered. The full article can be found at http://www.officer.com/web/online/Technology/37-percent-More-Cops-Died/20$48393. Jim is an Ambassador for the National Law Enforcement Officers Memorial Fund. Craig W. Floyd, Chairman and CEO of the NLEOMF, recently received a letter and special gift from Officer Stephen W. Burres, III of the Irving (TX) Police Department concerning the department's efforts to honor three of their fallen colleagues by supporting the National Law Enforcement Officers Memorial Fund. My name is Stephen Burres, and I am a police officer for the City of Irving, Texas. I am currently assigned to the Traffic Division, specifically the DWI Unit. I am also a very active member of our Honor Guard, an avid supporter of the NLEOM, and have had the privilege of performing the honor watch at the NLEOM in Washington, D.C., for one of our fallen officers, Officer Andrew Esparza. Irving is situated between Dallas and Fort Worth, Texas, and is a city of over 250,000 residents. We are also home of the Dallas Cowboys football team and headquarters to several other corporations such as MADD, Zales, and Exxon/Mobil. Our old patch, which is enclosed, was the only patch in the U.S. with a sports franchise logo on it. In the history of the Irving Police Department, we have suffered the devastating loss of three of our brightest officers: Officer Glenn Homs (7/3/1993), Officer Aubrey Hawkins (12/24/2000), and Officer Andrew Esparza (4/13/2007). Officer Homs was struck and killed by a drunk driver while assisting a motorist who struck a cow that was on the highway; Officer Hawkins was shot and killed by the Texas 7 after they escaped from prison; and Officer Esparza was killed in a patrol car accident while going to assist another officer. These three men paid the ultimate sacrifice for the citizens they served and their chosen profession and should never be forgotten. Thank you for honoring all of America’s fallen law enforcement officers. Each year the Irving Police Departments’ DWI Unit sells t-shirts with Officer Homs' badge on the front, and we donate our entire profits to Mothers Against Drunk Driving, Victims’ Assistance at the annual “Walk Like MADD” 5K walk. Officer Esparza’s brother is still currently assigned to our tactical team, and he and his family have set up the Andrew Esparza college fund. They have created a t-shirt with Andrew’s badge on the front, and the profits go to support the college fund. For the past several years we have not had a charity or organization that we thought would be suitable enough to donate money in memory of Officer Hawkins. 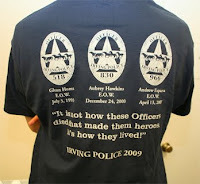 This year, the Irving Police Department created a new t-shirt design that has our new patch on the front and the badges of the three fallen officers on the back, along with one of the quotes that is written on the Memorial wall. Texas currently holds Texas Police Week on odd numbered years, and our Honor Guard recently participated in the Police Week events in Austin, Texas, back in May 2009. Officer Esparza’s name was added to the Texas Peace Officers’ Memorial that is located behind the state capitol. This was our t-shirt design for that event, and we will be creating new shirts for Texas Police Week biannually, with all profits going to the NLEOM in Washington, D.C.
Needless to say, our t-shirt sales were a huge success. Enclosed please find a check in the amount of $2,500 that the members of the Irving Police Department would like to donate to the National Law Enforcement Officers Memorial Fund in memory of all three officers. We hope that the Memorial can put this money to good use to continue the great job that you are doing. We look forward to making this a biannual event. 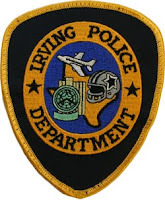 If there is ever anything that the Irving Police Department can do for you or the NLEOM, please do not hesitate to ask. Again, thank you for your dedication to honor all of America’s fallen officers. The National Law Enforcement Officers Memorial Fund extends our sincere gratitude to Officer Burres, his colleagues at the Irving Police Department, and the families, friends, and other survivors of Officers Glenn Homs, Aubrey Hawkins, and Andrew Esparza for their wonderful support. It remains the deadliest day in U.S. law enforcement history: 72 peace officers killed in the line of duty during the terrorist attacks of September 11, 2001. Seventy-one of those officers died at the World Trade Center. One officer—Richard Guadagno, a sworn refuge manager with the U.S. Fish & Wildlife Service—was among the passengers who died in Pennsylvania while fighting to regain control of Flight 93 from the terrorists. Thirty-seven members of the Port Authority of New York and New Jersey Police Force were killed on 9/11, by far the most fatalities suffered by a single law enforcement agency in one day in U.S. history. Among those heroes was the agency’s Superintendent, Fred Morrone. He was in his office in Jersey City on the morning of September 11th when the hijacked planes slammed into the World Trade Center. As head of the force, he certainly could have set up a command post at a safe distance from the action from which to direct the rescue effort. But that wasn’t Fred Morrone. Instead, he rushed to lower Manhattan and raced up the stairs of one of the burning towers, reassuring terrified victims coming down that they would be OK. When the tower collapsed, Fred Morrone’s distinguished, 38-year career of helping others came to an end. On Friday morning – the 8th anniversary of the terrorist attacks – U.S. Attorney General Eric Holder joined NLEOMF Chairman and CEO Craig Floyd, along with Board members and staff, at the National Law Enforcement Officers Memorial to honor and remember the 72 officers who died on 9/11 and whose names are engraved on the Memorial. “For me, as it is for so many Americans, today is also personal,” said the Attorney General. “My brother William is a retired Port Authority police officer. He knew people who died that day. And my family and I will always be reminded of the courage his colleagues demonstrated, and the price so many of them paid in service to their country.” (Read Attorney General Holder's prepared remarks.) Under steady rain and with flags at half staff behind him, the Attorney General began the reading aloud of the names of the 72 fallen officers. He then helped to place a wreath and commemorative poster along the Memorial’s west wall, where those names are engraved. He paused and reflected, and tenderly touched the wreath. In general, names are added each year to the National Law Enforcement Officers Memorial in random order. But in the spring of 2002, when it came time to engrave the names of the fallen officers from 2001, the NLEOMF decided to make an exception. The 72 heroes of 9/11 would be engraved together, in a continuous string along Line 23 of the Memorial’s west wall. It took 14 panels – 9-West through 22-West – to accommodate all of the names. 9/11 was a heroic, yet deadly, day for many law enforcement agencies – local, state and federal. In addition to the 37 fallen heroes of the Port Authority Police Force, the New York City Police Department lost 23 members; the New York State Department of Taxation & Finance, five; and the New York State Office of Court Administration, three. The FBI, U.S. Secret Service, and U.S. Fish & Wildlife Service lost one member each. And a New York City fire marshal who had sworn law enforcement powers perished at Ground Zero and is among the 72 law enforcement heroes who died that day. 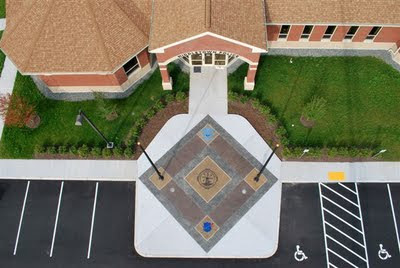 Last year, as Chief Anthony Pesare of the Middletown, RI, Police Department was going over the final designs of his department’s new headquarters building, he had an inspired idea: create a memorial walkway in front of the station to “recognize the sacrifice others have made in order to assure our future.” Chief Pesare contacted the NLEOMF about incorporating our iconic “Rose & Shield” logo into the walkway design. On Wednesday afternoon, September 2, Chief Pesare and other leaders of the community on Narragansett Bay formally dedicated the new police station at 123 Valley Road. Members of the public were invited to tour facility and appreciate the memorial walkway – the latter funded, in part, by donations from the community. While the Middletown Police Department has never experienced a line-of-duty death, the walls of the National Law Enforcement Officers Memorial are filled with some 18,661 officers who have made the ultimate sacrifice throughout U.S. history. Forty-one of those heroes are from the state of Rhode Island, including three officers from the community of Newport, about seven miles south of Middletown, who were killed in the late 1800s and early part of the 20th century. The month-long exhibit is housed in the Stephen P. Clark government center. Each day at noon, a recording of the officers' names will be played. More details about the tribute, including photos, can be found at the Miami Herald website. The NLEOMF joins with the Georgetown, DE, Police Department and the state's entire law enforcement community in mourning the death of Patrolman Chad Spicer. Patrolman Spicer was shot and killed last evening after he and his partner had stopped a vehicle on U.S. 113 that had been involved in an earlier shooting. As the three suspects exited the vehicle, one of them opened fire, killing Patrolman Spicer and critically wounding his partner. A four-year law enforcement veteran, Patrolman Spicer is the first member of the Georgetown Police Department to be killed in the line of duty. Line-of-duty deaths—in particular, deaths resulting from gunfire—are extremely rare in Delaware. There are currently 33 officers from the state whose names are engraved on the National Law Enforcement Officers Memorial in Washington, DC, dating back to Delaware's first known death in 1863. Only New Hampshire (33) and Vermont (19) have experienced fewer officer fatalities. Delaware’s last line-of-duty death occurred more than five years ago, in July 2004. State Police Corporal Christopher Michael Shea was killed in an automobile crash caused by a drunk driver. The last officer from the state to die in the line of duty from a gunshot wound was Dover Patrolman Daniel Schneible. He was shot in October 1969 while searching for a shoplifting suspect in a vacant house. He died 24 years later, in December 1993, from complications related to his injuries. Before that, the last officers shot and killed were Delaware State Troopers Ronald Carey and David Yarrington, who were gunned down in January 1972 by the female accomplice of a suspect they were struggling with. Of the 33 Delaware officers currently on the Memorial, just nine were killed in firearms-related incidents. Patrolman Spicer is the 10th. As we grieve over his tragic death, we also salute all of the fallen heroes of Delaware law enforcement. Their service and sacrifice will always be remembered on the National Law Enforcement Officers Memorial. Police Officer JOHN F. BAYLIS, 09/09/1863, Wilmington P.D. Police Officer ANDREW T. PETERSON, 06/27/1885, Wilmington P.D. Patrolman FRANCIS X. TIERNEY, 03/06/1915, Wilmington P.D. Patrolman THOMAS L. ZEBLEY, 11/13/1919, Wilmington P.D. Matron MARY T. DAVIS, 05/11/1924, Wilmington P.D. Patrolman HOWARD P. ATWELL, 06/29/1926, Wilmington P.D. Patrolman MILTON A. WIMBROW, 12/31/1931, Wilmington P.D. Patrolman WILLARD E. PRUITT JR., 07/07/1944, Wilmington P.D. Detective THOMAS P. CONATY JR., 12/26/1946, Wilmington P.D. Patrolman HARRY PASSMORE CLOUD, 07/02/1955, Delaware River & Bay Auth. Patrolman JAMES HENRY HILL, 07/10/1970, Seaford P.D. Auxiliary Police Officer WALLACE A. MELSON, 08/21/1971, Ocean View P.D. Corporal PAUL JOHN SWEENEY, 11/30/1972, New Castle County P.D. Patrolman FRANCIS T. SCHNEIBLE, 12/20/1993, Dover P.D. Patrol Officer VINCENT A. JULIA, 02/09/1996, Delaware River & Bay Auth.